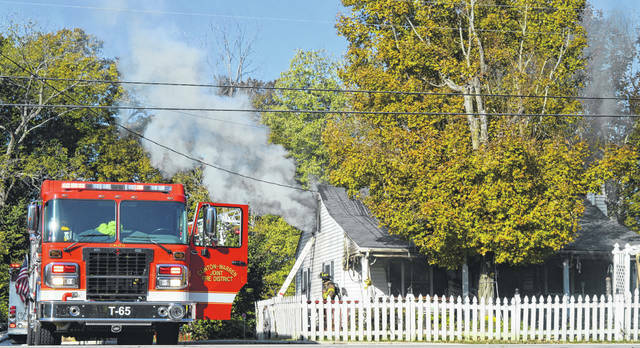 A grease fire on a cooking stove got out of control Tuesday morning, spreading to the second floor of a house on U.S. 68 South in Washington Township. Wilmington Fire Chief Andy Mason said the blaze basically gutted the second floor and half of the first floor. The occupant tried to put the grease fire out with a towel and water. Water on a grease fire is never recommended, the fire chief said. He characterized damage to the house as a total loss. No injuries are reported. One woman lived in the house, and Red Cross responded to the scene. The Clinton Warren Joint Fire District & EMS provided mutual aid to the Wilmington firefighters.